The Eddie Mae Herron Center building originally housed St. Mary’s African Methodist Episcopal Church, and the original building marker (like a cornerstone) is still on the property. Rev. J. A. Johnson P. E.
“P. E.” stands for “Presiding Elder”. This title was once used in Methodist Churches to identify the person in charge of all the churches in a particular area of a state. In more modern times the title has been changed to “District Superintendent”. 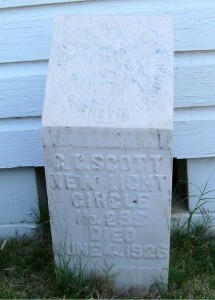 This is the grave stone of C. C. Scott, an African American who moved to the Biggers, Arkansas area in the 19th century. 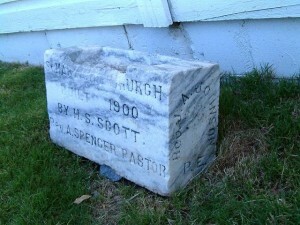 Scott became quite wealthy, owning much farmland in the Biggers area as well as Scott’s Ferry on the Current River. 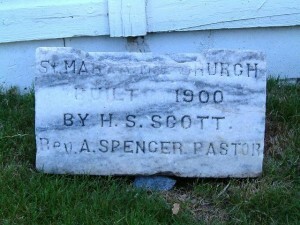 When Scott died in 1926 he was buried on his land, but in later years the headstone was found laying in a ditch, the cemetery property apparently having been cleared and turned into farmland. Those who found the stone felt the Eddie Mae Herron Center was an appropriate place to display the stone. 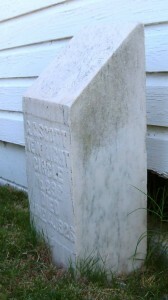 C. C. Scott, was an African American who moved to the Biggers, Arkansas area in the 19th century. 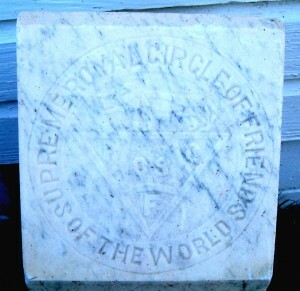 The Supreme Royal Circle of Friends of the World was founded in 1909 in Forest City Arkansas by Dr. Richard A. Williams. This fraternal organization for black men had as its primary goal promoting the moral, physical, intellectual, and material welfare of its members. The success of the Royal Circle was partly due to blacks’ mistrust of government and white owned banks. The Royal Circle of Friends offered great returns for small investments, with the support of friends, neighbors, churches, and respected black business leaders. The fee for joining the Royal Circle, including a medical examination, was $2.50. Members then paid $1 per quarter, which paid $300 to the beneficiary after the member’s death. 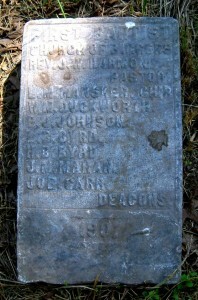 For years to come, in rural black cemeteries loyalty to the Royal Circle of Friends was indicated by the distinctive headstones that displayed the organization’s symbol of the majestic lion and letters RCF.